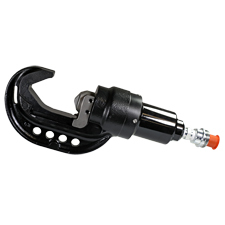 BURNDY®, a leading manufacturer and provider of compression connector solutions to the industrial, energy, construction, telecommunications, petrochemical, data center, and transportation industries, is pleased to introduce the Y444SBH Series of Dieless Remote C-Head crimping tools. Expanding on the recently released PAT444S battery platform, the Y444SBH 11-Ton C-Head dieless remote tool operates on 10,000 psi pressure and is made to cross over both utility and commercial/industrial applications. Built off of the existing 644 crimping tool platform, the Y444SBH features a C-Head design allowing for both easy access and more flexibility. The dieless, nest and indenter crimping profile offers a large range taking capability, eliminating the need for stocking multiple die sets. Connections made with the Y444SBH are UL Listed to UL 486A-486B on Copper and Aluminum terminals and splices. They also comply with ANSI C119.4 on YDS-RL and the new YDS-RLNI Splices (ACSR, AAC, AAAC, ACAR). This crimper is offered with a 5-year limited warranty. Other BURNDY splice families coming soon! For additional information, contact us at 47 East Industrial Park Drive, Manchester, New Hampshire 03109; call Customer Service at 1-800- 346-4175; or visit our website at www.BURNDY.com. Since 2009, BURNDY® LLC has been a key brand under Hubbell Incorporated. More information can be found at www.Hubbell.com.